I have always loved cycling and have been on many cycling holidays over the years with my wife Anna. 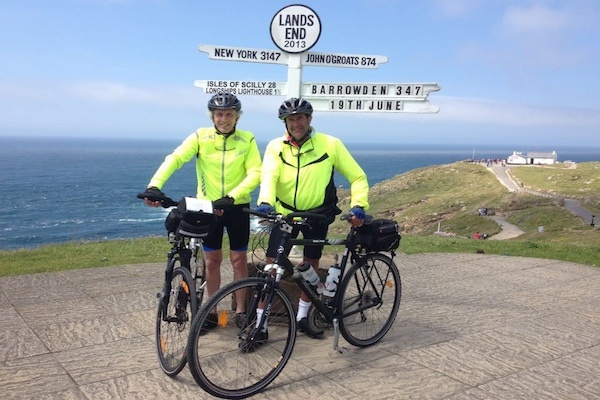 Having always fancied the challenge of cycling from Lands End to John O’Groats, I decided that since I turned 60 this year, this was the time to do it! Having lost my best mate Boyo to bowel cancer, and my Sister in Law Lucy to ovarian cancer in the last couple of years, I felt that I really wanted to do something positive for them and make a difference for other people touched by cancer. I knew I wanted to raise money for a cancer charity, so some of the big well known charities immediately sprung to mind. Then, I spotted that the local Sue Ryder hospice, Thorpe Hall, were fundraising to build a 20 bedroom extension to add to the fantastic facilities they offer patients. Both Boyo and Lucy had spent time in this hospice and we had all witnessed first hand what a difference this special place had made. I knew straight away that this was the cause for me, so I contacted Sue Ryder. Knowing all the money I raise will go to Thorpe Hall means it has a real connection for me, and what I want to do. I then set about assembling a team of 7 riders, with various friends and family accompanying me for small sections of the epic journey I had ahead. Well, I have never undertaken a big fundraising challenge like this before and being something of a technophobe the prospect of online fundraising was a bit daunting. However, Sue Ryder actually set the page up for me and I soon sent out a link to all friends and family, with a great response. The local pub in my village has a microbrewery, and I managed to persuade the landlord to brew up a barrel and donate all the profits to support my cause. It was called ‘7 Ryders’ in honour of the 7-strong cycling team and our Sue Ryder cause. 800 pints were sold adding £400 to my total! I had some posters made, which I displayed at work, and also put Sue Ryder collection tins on the counter. My customers gave some very generous donations. Finally, I contacted the local press who ran a story about my fundraising adventure. In the end, I raised over £6,000 for the hospice extension, which I feel really proud of. I was already used to cycling long distances, but I knew this was going beyond anything I had done before. I cycled at every possible opportunity, turning my 8 mile commute to work into a training run every day, and cycling through woods near my village at the weekends. I also planned longer road routes around the local area, progressively increasing my distances to get my stamina up. I kitted out my bike with all the gadgets I would need to make my journey easier. Speedometer, panniers, water bottles, a bell, mirrors, you name it, I had it! Having said that, my mate Ian rode with me for a day on his 20 year old Raleigh in a pair of combat shorts, and having done only 2 miles training. He pedalled through 60 miles with a smile on his face proving you really can do anything you set your mind to! All the idea, no gear! I completed the ride in 3 weeks and 2 days, covering 1,100 miles on my route. Some have done it faster, and some have done it slower. I can say that I did it at my pace and thoroughly enjoyed the whole journey, even the hard bits. I had some great laughs with friends along the way, and in the sections when things got really tough, checking my ever-increasing fundraising total really spurred me on. I also did a blog that allowed everyone back home to follow my progress, and I think this helped keep the donations coming in. I can honestly say that this is one of the best things I have ever done… EVER! I didn’t expect to raise anywhere near £6,000 but people really got behind the challenge and I feel very proud to have made a difference.